Mice are one of the most common pests found in homes. This isn’t the case only for homes in Sacramento, but for homes across the United States. While a mouse here and there might not be the worst problem to have on your hands, it’s not uncommon for rodent problems to be far worse than the face value we see. Earthwise Pest Management has provided specialty pest control services to residences and business with severe rodent problems. If you’re beginning to think that there’s a mice infestation on your hands or that the problem may be worse than you initially thought, today’s blog is for you. We’re going to touch on a few of the signs that show that your rodent problem is seriously out of hand! Like we said earlier, seeing a mouse here and there doesn’t necessarily mean that there’s a problem. We’d like to point out, however, that seeing mice frequently or on a regular basis is a sign that you have a serious rodent problem on your hands. When the rodents are no longer afraid of you or the movement that is happening in the space, you know that there’s a bigger problem. When rodents first find a new home they’ll do their best to stay out of sight and out of mind. Usually, they’ll be found in basements, attics or hiding in spaces that will go undisturbed for long periods of time. If you start to notice mice running and you’ve seen them more than once, there’s a good chance that you’re dealing with a mature infestation. Discovering droppings is one of the easier ways to tell that you have a rodent problem in your space. If you haven’t actively been looking for droppings, you’re likely going to find them in areas where food is stored or by your pets food bowl. Finding a consistent source of food is an absolute must for rodents that are looking to survive. Once they’ve found a meal, you won’t find the droppings far behind. If you are noticing droppings around your kitchen, in the cafeteria, or by your pets food bowl, then you know you’ve got a rodent problem that has found a food source and is thriving because of it. Now, droppings are not a telling sign that an infestation is mature, but if they continue to find a food source the problem will grow. Once you notice them, try to improve the storage approach that you’re taking with your food and clean up your pets’ food more routinely. This will, at the very least, cut off the food source for the mice. Now that we’ve talked a little bit about the food source that mice need to survive, let’ talk about the housing situation. Mice are known for creating nests and calling it home, so finding a nest is a good sign that there’s an infestation in the making. These nests are commonly made from grass, straw, trash, and the like. They’re pieced together delicately in a way that they have something to nestle into and store food as needed. Finding a nest is one of the many ways that you can determine just how serious your rodent problem is. As you may have assumed, the larger the nest the larger the infestation. While even one mouse that has the means to make the nest will do so, larger nests are a sign that there are multiple mice traveling together and infesting your home. If you do find a nest, don’t try to take care of it on your own. These nests are often full of mice droppings and can also carry bacteria. Aside from that, nests can also pass deadly diseases. Hantavirus is one of the most well-known viruses that mice can pass on to humans. Breathing in the contaminants of a nest can lead to an infection of the respiratory system and can become deadly. Regardless of how safe you think you’re being, do not remove a nest on your own. Seeing, smelling and hearing are all senses that will tip you off to a mouse problem. We touched on seeing mice around the space, and the nest is the most likely way that you’ll smell a rodent problem, so now it’s time to touch on hearing. These small pests are able to fit into some of the smallest cracks, and while that might make it easier for them to remain out of sight, there’s a good chance that you’ll hear them. Whether it’s in your ceiling or your walls, you may notice a faint scratching or the sound of little footsteps. When you’re able to hear the mice in the walls or in the ceiling, there’s a good chance of there being a nest that you have yet to find too. If you’ve heard the mice for some time now, then they’re in a state of comfort in the area that they’ve found, which is just the beginning of a bigger problem. 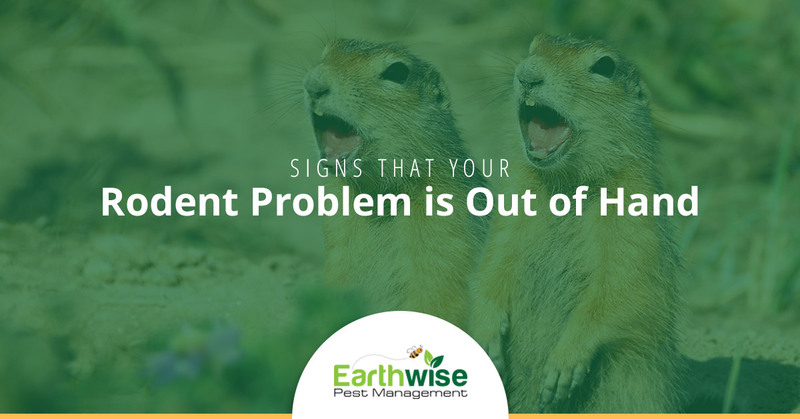 When you’re dealing with a serious rodent problem, Earthwise Pest Management is always there to help. With our years of experience, we’ve been able to tackle more than enough rodent infestations and have nailed our method down. With our integrated pest management approach, we’ll be able to safely remove of the rodents in your house or office space and provide you with a list of recommendations on how you can prevent rodents in the future. The longer that you let this problem go, the worse it’s going to get. Contact our team today and we can schedule a FREE inspection of your space so that you can gain some clarity on the situation. From there we’ll be able to provide you with a plan of attack and help you get it scheduled. Our goal is to provide you with the assistance that you need to eliminate rodents and proactively avoid them in the future. Reach out to us today and let’s get those rodents of your hands!